हमारे बीच कुछ चीज़ें, सवाल, बातें और खेल कुछ हद तक हमारी रोज़मर्रा से समय को खींचते नज़र आते हैं। और वो खींचाव कहीं न कहीं किसी पड़ाव की तलाश में घूम रहा होता है। कैसे कोई संसारिक मुहावरों में जीने लगता है और ज़िन्दगी के पहलूओं पर एक खास नज़र बनाता है कि इस बाग-दौड़ में जिया कैसे जाए? A group of Delhi writers from the working class brings you closer to the Indian metropolis than you've ever been, says Raghu Karnad. Photograph by Paroma Mukherjee. Last September, an editor of the newsweekly Open, Hartosh Singh Bal, posted a typically provocational editorial on the magazine’s website. His wildly fired broadside accused Indian English fiction writers, “living in south Delhi and south Mumbai, writing for each other”, of being effete and lacking the guts to grapple with modern India. The names on the comment-stream that followed on Open’s website were like a roster of Delhi literati, who lined up to give Bal an eloquent thumping. Still, the episode exposed a nervousness in Indian English publishing, that for all the reviews and longlists, the writing just wasn’t catching fire. This fear is coldest in Delhi, which is quickly growing as both a source and a subject of writing in English. It’s a hell of atmosphere in which to encounter Trickster City. In 2005, eight Delhi writers began meeting to discuss how to write about the city. The congregations were part of the CyberMohalla labs organised by Sarai and the Ankur Society for Alternatives in Education. The question of how to write Delhi was an urgent one , as the still-vague idea of the Commonwealth Games was starting to reshape the city in very real ways. The writers’ group grew and continued meeting: men and women, all Hindi-speaking, all below 30, all residents of that other Delhi, the city of the tenth-pass, the vocational course and the government OPD. Scenes, questions and pieces of overheard conversation ricocchetted between them. Then, in early 2006 came a tragedy that scorched the book they would eventually write together. The High Court ordered the demolition of Nangla Maanchi, a slum colony on the Yamuna’s east bank. Some parts of it were bulldozed. Perhaps 30,000 people were displaced. A few of the writers had lived there, and they all haunted the place as the MCD and police slowly ground a living town into a mess of crushed brick and plastic sheeting. Visthapan, or displacement, became a hot word in their conversations. In 2007 Bahurupiya Shahar (Shape-Shifting City) was published by Rajkamal Publications. This fortnight, as part of Sarai’s decennial celebration, it will be released in English as Trickster City. It is a collection of short pieces – “part reportage, part fiction, part conversation, part Sufiana poetry”, according to contributor Love Anand. The way Trickster City pours light on the Indian megacity feels similar to how Arun Kolatkar’s Jejuri made the Indian pilgrimage town visible, using a mix of mockery, devotion, observed detail and vast imagination. The marvel of this book is difficult to pinpoint. It has a richness of recorded detail from the belly of a modern Indian metropolis. Its emotional range is large, from humour (as in the opening story, Jaanu Nagar’s Delhi Liner) to empathy (Neelofar’s My Mother’s Dread) to essay (Suraj Rai’s Having Seen it From Close). There is the sustained vitality of its translation into English by Shveta Sarda. Perhaps most impressive is the fact that Trickster City has no bad guys, not the police, not the state, not even the bulldozers. Whatever its literary strengths, any reader accustomed to Indian English writing is likely to approach Trickster City like a meaning-loaded dance with difference. The different-ness of the authors can seem like the key, the lock and the room, all at once. But to them it is beside the point. The book is not based on a partition between any worlds, said Anand. The writers all agreed that it wasn’t written as a message to either the elite or the downtrodden, but rather to the stranger who is everybody else and even part of oneself. But there’s no point saying their difference is irrelevant. Much Delhi writing has tried reaching down from above, to grasp at the experience of the non-elite, most famously the Booker Prize-winning White Tiger. This book seems to lay its hand directly on the flesh and nerve that is the human content of Delhi. The fact that CyberMohalla incubates this kind of creativity is a reminder that Sarai, whose publishing flies high over most people’s heads, is doing work that’s utterly relevant. 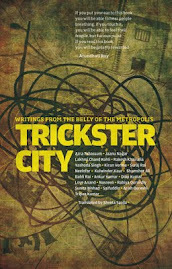 Trickster City, Penguin, Rs 499.